Jo Shapcott’s poetic retelling of the story of the disastrous 1845 Franklin expedition to the Arctic. 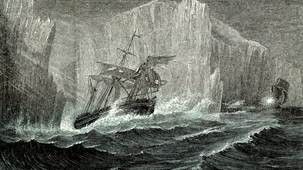 Searching for the North-West passage, the expedition was never heard of again, lost amidst rumours of madness and cannibalism. Jon’s integral music / sound score features dark soundscapes derived from the digitally manipulated sounds of crashing ice floes and haunting violin playing by Fiona Barrow.